Love fashion? Want to empower women? Volunteer at a specialty boutique. Dress for Success Cincinnati's mission is to promote the economic independence of disadvantaged women by providing professional attire, a network of support and the career development tools to help them thrive in work and in life. 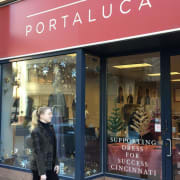 Portaluca, an upscale specialty resale boutique, is our every day fundraiser. The proceeds support Dress for Success Cincinnati's services to disadvantaged women. Portaluca is located downtown at 209 West 4th Street, just past the corner of 4th and Elm Streets. We have opportunities for volunteers on Fridays and Saturdays. We have a variety of boutique tasks, including assisting customers, hanging clothes and merchandising fashions. Portaluca hours: Tuesday, Wednesday & Friday, 10:00 AM-3:00 PM; Thursday 10:00 AM-6:00 PM; Saturday 10:00 AM-3:00 PM. Volunteer hours are flexible! Tell us when you can help! Portaluca needs volunteers on Fridays and Saturdays, and is open 10:00 AM - 3:00 PM on both days. Volunteers do not have to commit to the entire day, nor are they required to commit to every week. The busiest time is usually 11:30 AM - 2:00 PM.